We left Vietnam next day & flew to Siem Reap, Cambodia. Another favourite guide of many of our clients, Jeremy, was at the airport to meet us & transfer us to the new 5* deluxe Victoria Hotel. We already using Victoria hotels in Vietnam so we were not surprised at all to find the Victoria hotel in Siem Reap lived up to our expectations of beauty, luxury & service. Unlike other Victoria hotels in Vietnam, this one is built in the colonial style, quite grand & graceful, blended with local culture & colours. The imperial yellow dominated the colour scheme of the building with brown French shutters. The building & rooms are set along the four walls surrounding the inner courtyard in which is the large swimming pool with waterfall among the tropical flowers & trees of the garden. 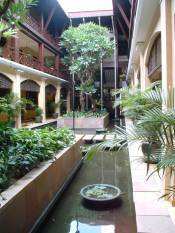 There is a inner water garden feature within both sides of the corridors along the hotel rooms. The beauty & calm is extraordinary. That evening while I was holding a cocktail drink in my hand at the lounge bar with open door view to the centre of the swimming pool below I whispered to myself that this is luxury indeed. We met up with Tom, our agent in Siem Reap over a lovely buffet dinner at Tonlesap Restaurant with performance of dance & music on stage. We drank several bottles of Angkor beer & I ate my favourite noodle soup & green curry. Next morning we moved to the new 4-5* Angkor Resort & Spa, a huge area of landscaped gardens with swimming pool, tennis court & spa centre for treatments. We were looking forward to go to Kbal Spean & Banteay Srei today. 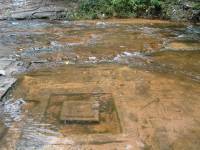 At Kbal Spean, the river of 1000 lingas has images carved in the stones of the river bed under the water itself. The road to get to Kbal Spean is bumpy and there is a 45 minute walk from the car park through forests with some climbing of steps & rocks. 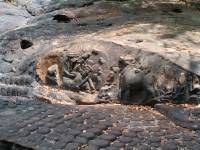 May is not the best season to visit Kbal Spean because the river is dry and the carvings are not being shown through the water to best effect. The best month to see it is after the raining season from July onward to March each year. Our picnic lunch of rice & two dishes, one normally fish & the other is meat with vegetable, was eaten in the large picnic area near the car park with a swarm of local boys & girls selling books, T-shirt & other souvenirs etc. It’s very hard not to give in to them & I ended buying two T-shirts from the girls & a book about Siem Reap from the boy who would not give up. The important thing is I felt happy afterward that I brought something from them. 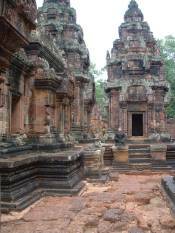 The afternoon trip to the temple of Banteay Srei was wonderful. The oldest temple is set in the jungle within walls & waterways. There are many beautiful carvings of figures among the pink sandstone remains. The beautiful carving & engraving are still very clear & detailed. The setting is very powerful. One wonders what it must have been like to ride into the jungle to find this magical temple years ago. If I was to travel back with a time machine this is the temple I would like to have seen in its original state. Because Kbal Spean yesterday was lacking in water today we tried Phnom Kulen where there is also a 'river of 1000 lingas'. The distance is similar except that the car can drive up all the way to the national park, which has a waterfall, temple & the river. The road is single track and so is used for upward traffic only in the morning & downward only in the afternoon. First we visited the temple where local people come for prayer. From the car park to the steps of temple, the road is lined with market stalls selling mostly herbal and traditional medicines including animal parts & skin. These are for the local people who come to the temple. Twenty or more steps will lead you to a natural huge rock where a large Buddha images has been carved out of the rock. A wooden staircase leads you to the large reclining gold Buddha temple. 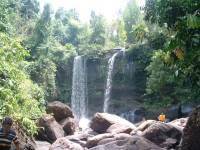 From here you can see the panoramic view of Phnom Kulen's lush green forests far away. A short drive from the temple to the river & here the river still has good level of water before the wet season begins. Approaching the river you will see the carving of Shiva & other images on the sandstone under the water. Apart from our guide, Jeremy, a group of local boys followed us as an additional guide, pointing out various images all the way along the river. We walked deep into the jungle to see more lingas with the extra help of these local boys. They want you to see it. It is a fascinating sight that you will never have seen elsewhere. A river hundreds meters long through the jungle with carved lingas covering the sandstone bed of the river. I recommend this trip to all our clients. Another short drive to the waterfall from the river for our picnic lunch & this is a popular area for the local people too. Because we were here on Sunday there were many local families here, come with picnics & swimming trunks for a day out. Children & adults alike all jump into the natural pools of water to swim & bathe on top of the waterfall or underneath it. We ate our lunch on one of the many wooden platforms used by the locals. Phnom Kulen means Lychee mountain, and sure enough many locals were selling lychees picked from the trees in this area. They tasted fresh & delicious. Before we checked in to the Pansea, we inspected a few other hotels in the afternoon. The Angkor Village Resort is a delightful boutique resort., built inside a wall with tropical gardens & ponds. The room are built in a thatched bungalow style. It’s more a resort than a city hotel, full of local charm & traditional style wooden architecture. It is a delightful surprise. We will use this hotel as our superior class hotel. Preah Khan hotel is a good standard class hotel. The building is new & has the biggest swimming pool among the 3* hotels. Shinta Mani is a unique hotel. The hotel is very small but with all the ingredients of a 4-5* hotel. The room is beautifully decorated in modern minimalist style blended with local style. Some of the rooms have a courtyard leading to the swimming pool. The swimming pool is a deep blue colour like the deep ocean. The nearby spa room is relaxing & beautiful. The whole place is stylish & modern with a touch of class. The manager, Martin Dishman, offered us a wonderful meal in the stylish French restaurant. The Pansea is still our favourite hotel. The beautiful gardens & swimming pool are calm & relaxing, while the décor is a modern & simple blend of Western chic and Cambodian style. We will continue to use it as our top superior hotel. The next day we set off for Laos.